1. A low or downcast state, the act of being humiliating: The abjection of poverty made it difficult for Eileen to raise her children and send them to school. 2. 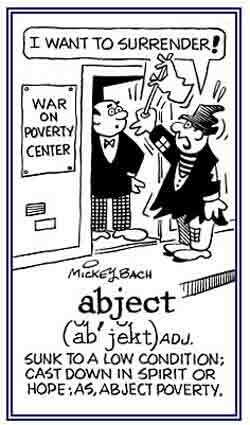 A condition of being servile, wretched, or contemptible: In school, the students studied the various abjections of human situations and learned strategies that would help them to avoid miserable lives in the future. 1. With great shame, desperately: Too many people in the world remain abjectly poor. Jeffrey sighed and abjectly walked away after being exposed as a swindler. 2. In a hopeless resigned manner: Joshua abjectly shrugged his shoulders when his wife started another session of complaining. 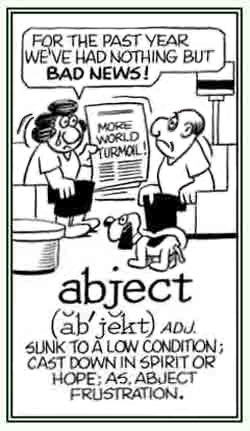 —Authorized usage by Word A Day Revisited. for a list of other images which you can enjoy. 1. A condition in which a person is down in spirit or hope; miserable: Jack's abjectness was caused by the fact that he had been walking all day at the book fair and his feet were hurting. 2. Submissive or fawning in attitude or behavior: Terri's abjectness revealed that she was so servile and overly willing to serve or to obey other people that no one respected her. Words or phrases that modify nouns or pronouns: "There are several types of adjectivals; including, adjectives, adjectival prepositional phrases, participial phrases, and relative clauses all of which can help a writer make language more creative, interesting, and colorful." "Without adjectivals, much of the color in language would be lost and these words allow people to describe in more detail the nouns and pronouns about which they are speaking or writing." "Adjectivals modify nouns and pronouns by providing information that answers the following questions about nouns or pronouns: What kind? Which one? How many? or How much?" 1. In grammar, a word that is used to describe a noun or a pronoun by providing more information about those parts of speech: "Adjectives slightly change the meanings of other words by adding descriptions or by making them more specific." 2. Any member of a class of words that in many languages are distinguished in form, as partly in English, by having comparative and superlative endings: "Adjectives function as modifiers of nouns; such as, good, wise, perfect, beautiful, bad, sad, loud, etc." 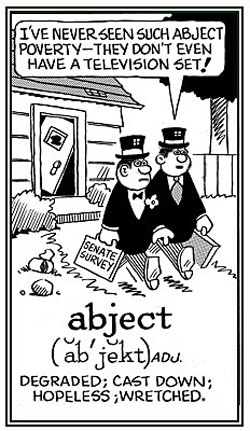 "The three most common adjectives are the articles: a, an, and the. The a and an are the indefinite articles; they refer to any one of a class of nouns. The, is a definite article that refers to a specific noun." "Examples of the indefinite articles, or adjectives, are a contest, and an opportunity. A definite article sample is the writer." 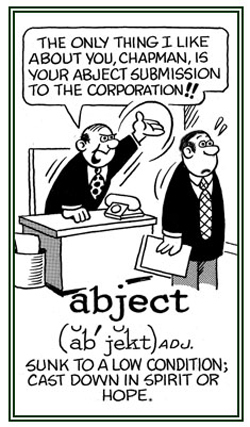 Used in grammar when referring to a modifier (descriptive word/words) of a noun or a pronoun. A strong current of electricity which flows through the auroral zone during a polar substorm. A geomagnetic perturbation (confusion or disorder) lasting one to two hours, which tends to occur during a local post-midnight time. The magnitude of the substorm is largest in the auroral zone and corresponds to an injection of charged particles from the magnetotail into the auroral oval. Showing page 1 out of 8 pages of 114 main-word entries or main-word-entry groups.